I guess that’s the point though. Those cookies are too much anymore. We’ve all held on to those cookies, devouring them because we can, sharing the sugary sweetness with smiles and laughter. Things need to change because the scales have tipped…literally. So, I had accepted Cookie Monster’s fate, and headed to Sesame Street Live yesterday with Little Sprout curious about how they’d change things. 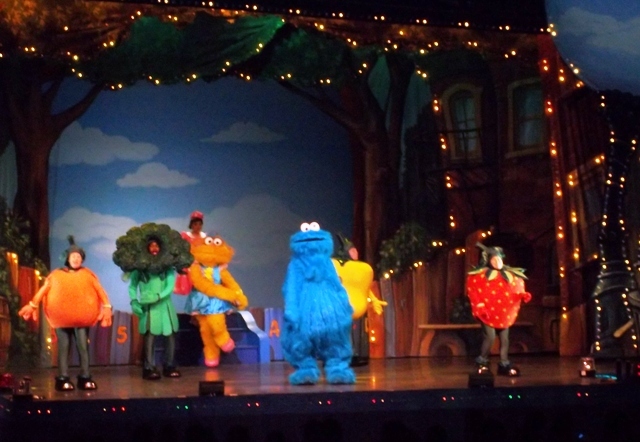 The title of the show: Elmo’s Healthy Heroes and in true Sesame Street fashion, the writing was witty, the songs were entertaining, and the message was positive. Eat well, rest often, exercise regularly and stay up on hygiene. Cookie Monster even conceded that having an occasional cookie is okay, but that eating the colors of the vegetables and fruits was even better. Balance, discipline and good choices. The intermission that changed everything for me. Fifteen minutes before the end of the show, the lights came up, the curtains closed and an announcement was made that there would be a short break. Bunches of helium-filled Elmo heads made their way to the floor of the arena and the food carts emerged. Children were heard begging their parents for something, and that is exactly what the producers intended. What I could not believe was the rate with which the parents shelled out money for food and snacks, hungry to consume, but oblivious to the fact that they were discounting everything that had just been said. The snacks offered: blue and pink cotton candy, bags of greasy mini-donuts, colored slushies and enormous glasses of sugary lemonade. Had I gone up to the concourse I could have gotten a large bag of salty popcorn, or processed nachos or a concession pretzel. Candy and cookies were up there too. I was dumbfounded. My pissed off five-year-old didn’t understand why I stood there in personal protest refusing to buy any treat. I eventually broke down because my daughter reminded me I had promised her something. I got an $8 lemonade and was immediately relieved it was more watered down than sugary. I’m still fired up, and unsure about what to do. I am fired up to eat better, to move more, to rest often, but I think the overall options need to change. People will continue to eat what’s in front of them, so what’s presented to them needs to be different. Who is going to step up to make the message meaningful? When is cutting down the size of people’s bottoms going to mean more than the bottom line? Just like everyone else, I want to resist changing Cookie Monster to Veggie Monster, because change is uncomfortable. But a nationwide epidemic of obesity is terrifying, and we should all start making changes…one celery stick at a time. I am with you 100%!!! We took Matthew to the show this past Sunday. He loved it!! I have to admit, I fell into the trap. Before I even sat down; I flagged the mini donut vendor over so I could have my favorite junk food :-). I tried to tell myself that they were overripe, discolored, tomatoes with holes in them! !